before a crime has even been committed. one eye open in case things change whilst they sleep. to fight a sudden storm that might engulf them. 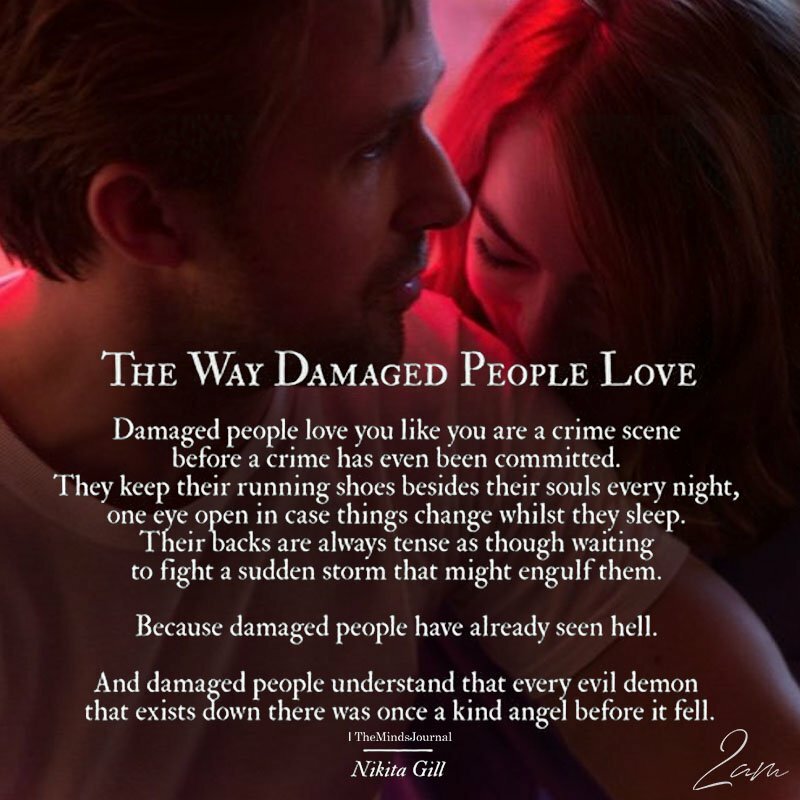 Because damaged people have already seen hell. that exists down there was once a kind angel before it fell. These days love and emotions have almost lost the actual charm thereby resulting in the weakly bonded relationships… And there follows the heartbreak and the real torture for those who took every moment as worthy as to keep it as a cherishable memory. Quickly you are able to transform the form of energies, from frustration, rage, grief (negative) to inspiration and motivation, (positive) and hence are one of those people who have experienced the dark as well as the brighter phase. Heart breaks are indeed necessary to build up into a stronger self. Look within and intensify this bond. Since this is the span when you want to be alone, it gives you the best opportunity to have a session of self-introspection and hence know your worth. It is painful to lose your favorite person but there is a universe that loves you beyond and unconditionally. Heartbreak helps you learn this lesson in life. The best person to love is oneself. For when you love yourself you look within and find new avenues that you passionately love, but could have ignored before due to your obsession with an individual. 2. It makes you self-reliant. You become selective before trusting people. Blind trusting is out of the list. You learn to expect only from yourself, because failed expectations hurt a lot. So it is in a way leading to a more mature person. A mature ‘You’. They love better because they know how it feels to be broken.